Alternating bands of knit 2 purl 2 rib, separated by 2 rows of purl stitches, give a lovely honeycomb effect, both on and off the foot. 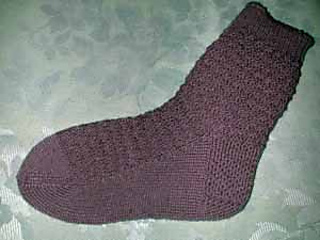 The rib-like effect of the pattern is most accommodating, fitting a woman’s medium or large foot, or a man’s medium foot with no adjustment to the pattern required. As written, the pattern will give you a 15cm (6”) cuff, 9cm (3.5”) heel depth, 23cm (9.25”) foot length, which fits my ladies’ size 10 (26cm) foot perfectly. You will have about 3 metres of yarn left from each skein. If you require a longer cuff or foot, you will need more yarn.